New York University Press, 9780814705117, 384pp. In the early 1990s, Albania, arguably Europe's most closed and repressive state, began a startling transition out of forty years of self-imposed Communist isolation. Albanians who were not allowed to practice religion, travel abroad, wear jeans, or read "decadent" Western literature began to devour the outside world. They opened caf's, companies, and newspapers. Previously banned rock music blared in the streets. Modern Albania offers a vivid history of the Albanian Communist regime's fall and the trials and tribulations that led the country to become the state it is today. 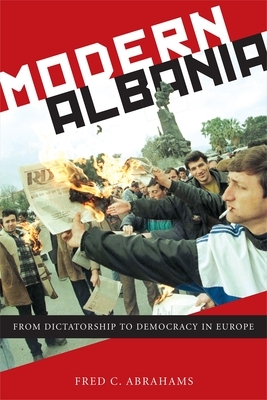 The book provides an in-depth look at the Communists' last Politburo meetings and the first student revolts, the fall of the Stalinist regime, the outflows of refugees, the crash of the massive pyramid-loan schemes, the war in neighboring Kosovo, and Albania's relationship with the United States. Fred Abrahams weaves together personal experience from more than twenty years of work in Albania, interviews with key Albanians and foreigners who played a role in the country's politics since 1990--including former Politburo members, opposition leaders, intelligence agents, diplomats, and founders of the Kosovo Liberation Army--and a close examination of hundreds of previously secret government records from Albania and the United States. A rich, narratively-driven account, Modern Albania gives readers a front-row seat to the dramatic events of the last battle of Cold War Europe. Fred C. Abrahams is a special advisor at Human Rights Watch and a writer who has worked for twenty years in areas marred by political crises and armed conflict, including the Balkans and Middle East.